We've helped patients in 86 countries manage their pain. "I recommend this office for excellent care. Thank you guys." "Love Love Allpria Healthcare, individualized, sensitive, caring and support after visits"
"Allpria gives old school medicine in a "just numbers" medicine! " Allpria Healthcare is Colorado’s leading medical practice for pain management and addiction treatment. With an office conveniently located in Aurora, Colorado, a staff that is unparalleled in qualifications and experience, and an array of truly unique treatment options, Allpria Healthcare is a premier destination for rejuvenation, rehabilitation, and relief. 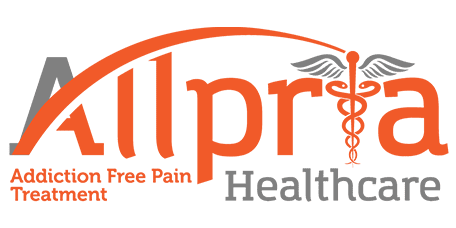 The team of highly skilled providers at Allpria Healthcare includes several board-certified physicians, including one of the very few pain doctors triple board-certified in anesthesiology, pain medicine, and addiction/substance abuse. They’re also one of the only pain treatment practices in the Denver area that performs dorsal root ganglion (DRG) spinal stimulation, an incredibly specialized procedure that fewer than 10% of pain medicine doctors nationwide are trained to administer. Allpria Healthcare focuses on non-addictive treatments to chronic pain, and is a leading provider of prescription opioid addiction treatments. The team is driven by compassion and dedicates the time and energy necessary to determine their patients’ needs and develop a tailored treatment plan. The ethos of the practice is to treat the whole person, taking into account their mental and emotional health in addition to their physical wellbeing. The empathy that patients experience at Allpria Healthcare is unparalleled due in large part to the background of their medical director, Christopher J. Frandrup, MD, who suffers from chronic pain and is intimately aware of the patient perspective. He has personally undergone many of the same procedures that he performs on his patients, and knows precisely what it’s like to rediscover joy and relief after being incapacitated by pain. Dr. Frandrup and his staff should be put up for "doctor of the year." He goes beyond his pain shots to help my case. Because of his push he has found out what I have had for the last 6 years!. WE’VE HELPED PATIENTS IN 86 COUNTRIES GET OUT OF PAIN & OFF OPIOIDS. WE CAN HELP YOU, TOO. Have you ever wished you had a doctor who really understood your pain? It’s extremely rare to find a pain medicine physician who is also a chronic pain patient. As a patient, our medical director, Christopher Frandrup, MD, has undergone many of the same procedures he performs on his patients. He knows what it’s like to go from being incapacitated by pain to enjoying your life again. That’s what he’s done both during and after his military service for wounded American soldiers in 86 countries. That’s what he wants for each of his patients. Allpria Healthcare accepts the following insurance plans (click to see full list). "Cigna AOP OA001 - NATIONAL OAP"
Ketamine infusions may be effective for various pain conditions such as neuropathic pain, complex regional pain syndrome (CRPS), migraines, fibromyalgia, post-herpetic neuralgia and spinal cord injury. Cervicogenic headaches are a frequently underdiagnosed headache that can cause pain not only in the head but also in the sides of the face. Chronic pain is a complex medical condition with no easy answers. While acute pain can often be traced to one particular injury or illness, why acute pain turns into chronic pain long after the accident occurs remains a mystery.